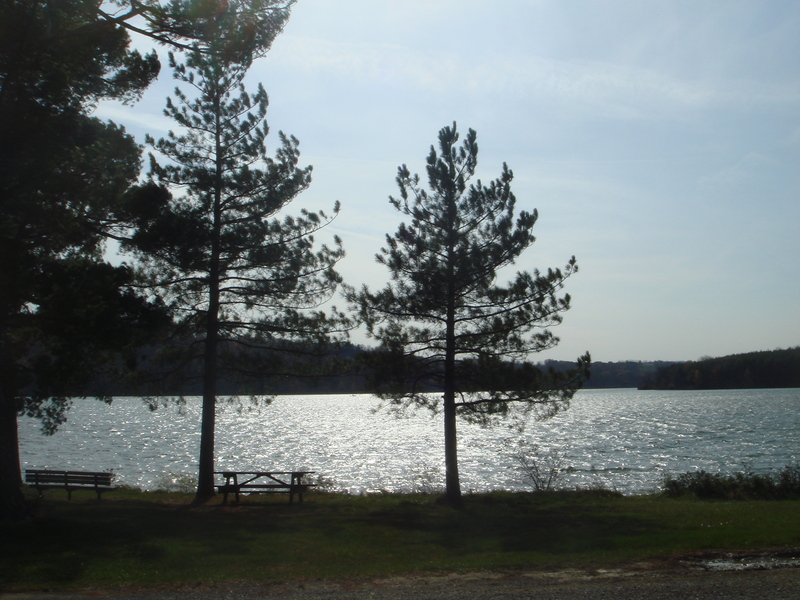 Prince Gallitzin State Park, located in Cambria County, is not the easiest state park to access, which lends it a remote charm. That said, when I visited last summer, the campground was rather crowded (though not overwhelmingly so), all of the best parking spots in the fishing areas were taken, and the lake was populated with a healthy number of boaters, so it’s no ghost town during the peak season. Returning to the park more recently, in the off-season, the situation was rather different; boaters were now the exception, and aside from the marina, most of the parking lots were all but vacant. The beach was closed, of course, and there were but a handful of anglers. There are two views of the lake that are worth making a special effort to visit; one is located off of SR 1026, and if you’re heading east, it will be located on the left. There are two entrances and they’re well-marked, but if you happen to miss it, the ranger station is just down the road, and you can turn around there. This first vista, called Mud Lick Overlook after the section of Glendale Lake it is nearest to, contains a pavilion that makes for a great inclusion in a photograph, if such structures are fitting to your artistic sensibilities. The second vista, amusingly titled Headache Hill Overlook, can be accessed en route to the west end of the lake (more on this later, but the road is called Beaver Valley Road and marked with signs that indicate that it is a relatively minor section of the park, but don’t be fooled: the best trails are in the west area). From Beaver Valley Road, make a right at the four-way intersection onto Long Road and bear left at the hill up to the structure that looks like a water tower. The tower can be climbed via a set of stairs, and it offers what appears to be a view of two lakes, but it’s actually the same lake (the connecting canal is hidden from view). The eastern section of the park is where the main beach is (there is a beach in the western section, but you have to be staying at the campground to use it, unless you want to walk a significant distance on a dirt trail in your swimming gear). It is also the site of a number of gentle, entertaining trails. To access this area, turn onto Buck Road from SR 1026 (don’t worry; it’s well marked). All of the beach parking lots are ultimately fairly close together, but the lot for Beach #3, at the end of Buck Road, is probably the “best,” in terms of design and lack of crowds. This lot is also where one would start on Turkey Ridge Trail or Huges Trail, which are worth your time. Also of interest is Lakeshore Trail; this trail begins directly below the parking lot for Beach #1, but if you’re parked at Beach #3, it’s silly to move your car. Instead, simply walk down to the beach and head south (with the lake on your right) until you reach the trail. The view is arguably better from the beach anyway, and you’re saving gasoline. The western section of the park contained the trails I enjoyed the most. The best place to park would probably be at the Point Trailhead, but one can also use the visitor parking section of the campground (turn at the campground entrance and follow the signs). The Point Trail itself is a delightful hike that passes through a cool swamp and runs along Glendale Lake for a significant length. It’s about three miles long, but it’s also one of those trails that doesn’t seem that lengthy due to the sheer enjoyment of the views it provides. One can also hike the Campground Trail, which connects at both ends to the Point Trail; exploring the section that runs along the lake is definitely worth your while. This section of the Campground Trail will lead you to the western shore beach, as well as by the Camp Store, which might be useful if you need a quick snack. Even if you’re not into fishing, stopping at some of the fishing areas is worth the time; the different perspectives of the lake are always a pleasure, and there are at least two that have unique features that might be of interest to photographers and general sightseers. The Beaver Valley Marina contains a cool little peninsula that seems to place you in the middle of the lake, and the Pickerel Pond area contains a neat little fishing pier and another bridge further back that permits one to construct a mini-walking loop. The trees in this area are also great for photographs. Directions: Well, the bad news is that there really isn’t an easy way to access the park, and even from Pittsburgh there are two distinct routes to Prince Gallitzin. This map might be useful, but consulting a Pennsylvania map would definitely be advised. The route I took involved following Rt. 28 north to Kittanning and then following US-422 east, but from there, the optimal route gets somewhat complicated…a route that’s easier to summarize (but longer) involves making your way to Monroeville, following Rt. 22 east, and then taking Rt. 53 north (per the map provided earlier).